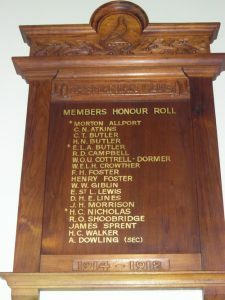 Honour roll carved date unknown, Tasmanian Club, Hobart . Who was Nellie Payne? It is unknown when Nellie carved this piece. 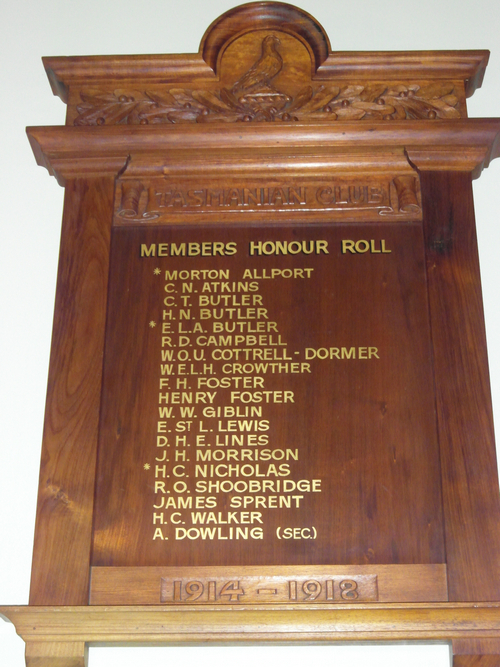 The Tasmanian Club is proud of its tradition established from its foundation in 1861. It is proud of its distinguished and diverse membership both past and present and the standing its members have in the community. Membership benefits include fine dining for small or large groups, convenient central location in the City of Hobart, accommodation and the world-wide range of reciprocal clubs. To visit the Club you must be a Member, a Member’s guest, or a member of one of our reciprocal clubs around the world. The Tasmanian Club was established in 1861 in Hobart by seventy gentlemen. It was founded on the ‘London pattern’, that is, election or exclusion of candidates by ballot. The Club was located in leased premises at Webb’s (now Hadley’s) Hotel from 1861 until 1873. In April 1873 the Club moved to its present location of 132 Macquarie Street. The Club building was built in the Georgian style in 1846, originally as the Derwent Bank for Captain Charles Swanston to a design of architect James Alexander Thomson. In 1891, following outright purchase of the land and buildings, major extensions were made to the Club building, including the main dining room and accommodation. The Tasmanian Club is regarded as the ‘senior gentlemen’s club’ of Tasmania by its interstate and overseas counterparts. It has an upper limit to membership of 400.